Children and parents, if you happen to have some idle cassettes in your household, Uncle Gert ‘Trash’ Moser would be a grateful receiver of those, to give them a new life and spread the message of music. A restless advocate of Estonian alternative and electronic scene, Trash has been running his DIY label Trash Can Dance for a couple of years and is showing severe signs of cassette affection. With “TEK DEF”, Trash has completed a compilation of local techno, a real hand-made product of recycled cassettes that come in three different insert designs. For the start, serious techno heads should not be turned away immediately with Darkside’s piano-driven eurotrance “Süüde!”, which could be a mood-booster after a hard day’s work. 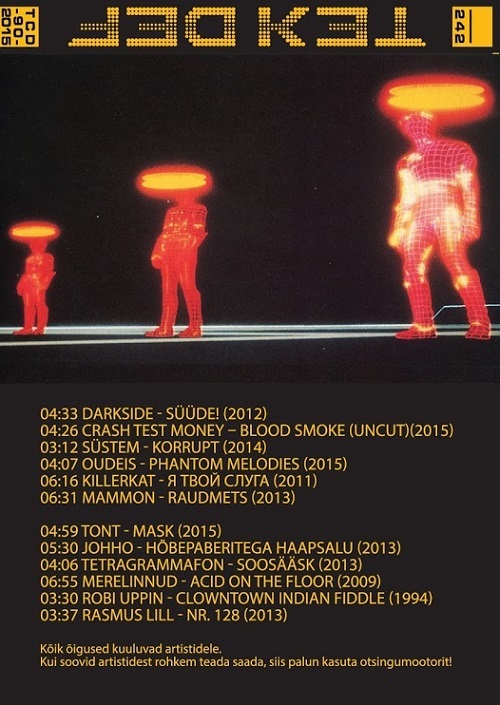 Other tracks are more in line with our understanding of techno, for example Blawan comes to my mind with Crash Test Money’s “Blood Smoke” and after big beat inclined “Korrupt” by Süstem, Oudeis mimics in “Phantom Melodies” Drexciya’s “Wavejumper”. By title, Killerkat’s “Я твой слуга” sounds like Kraftwerk tribute, but instead we get a veering straight floor track, like “Raudmets” by Mammon, a joint project of Killerkat and Glitchfxxx aka Artur Lääts. Tont’s “Mask” is like Nippon pop mingling with drum’n’bass and Johho (“Hõbepaberitega Haapsalu”) shows techno’s noisier side. After Tetragrammafon’s stringful deep house (“Soosääsk”) comes real warehouse slam “Acid On The Floor” by Merelinnud. Robi Uppin is a desperado riding in the wilderness with electro-esque “Clowntown Indian Fiddle” and for the end, Rasmus Lill’s crawling bassline is coded under “Nr. 128”. Techno has been an underdog of the Estonian scene and the efforts to consolidate most interesting Soundcloud finds to a compilation is a welcome move.